Leylandii is a common sight in gardens. If you’re looking for that, too, it’s better to learn more about this evergreen, fast growing hedge before buying. Here’s a handy guide about the different types of Leylandii. Growth rate: Up to 1 metre per year. The Leylandii Green is the most popular coniferous hedge as it is the cheapest and grows the fastest. It grows into a dense hedge that only needs pruning once or twice a year and can be maintained easily. The dark green foliage is beautiful and stays that way throughout the year. 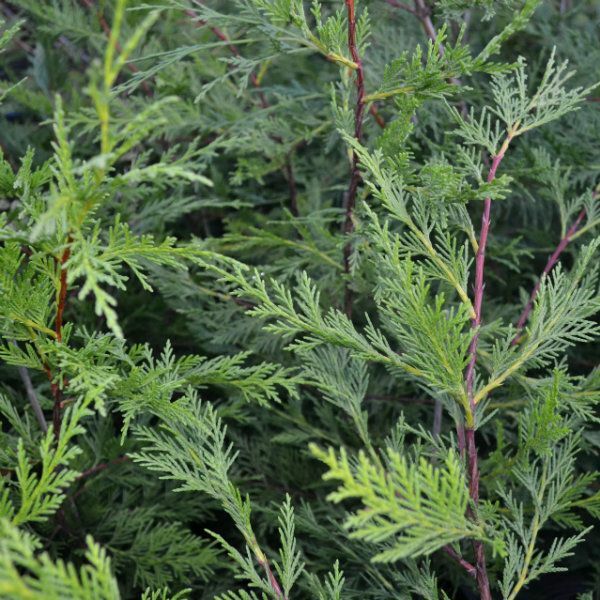 Derwen Wholesale offers potted and pallets of potted Leylandii. We also have this hedging plant shaped in a spiral. The dense bushes create a great sound barrier. Growth rate: Up to 75 cm per year. Extremely popular with the locals, the Gold Leylandii, or the Castlewellan Gold, grows very quickly, and if planted under full sun, its leaves turn a bright golden yellow in the spring and summer. If you’re looking for good deals for the Castlewellan Gold, you can check our potted and pallets of potted Gold Leylandii. Great at lowering noise pollution. Apart from waterlogged soils, the Leylandii Green can grow in almost all types of soils. The hedge prefers full sun or partial shade. Like Leylandii Green, Leylandii Gold also thrives in all types of soil except water-logged. Grows in full sun, where the leaves turn more golden, or partial shade, where the leaves turn only pale green. If you need more details about these fast-growing hedging plants or need to discuss which would be the best option for you, reach out to the experts at the Derwen Wholesale here or call us at (01938) 553015. Buy your choice of fast-growing hedge today!